Most limo services offer a standard set of limousines and town cars, but we aren’t most limo services. 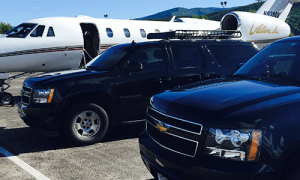 When it comes to airport transportation in the mountains, our limo service has to balance the needs of our customers and the demands of the unpredictable weather in the Aspen area. That’s why our limo service doesn’t have an average fleet of vehicles. Instead, we’ve managed to balance comfort, style, and ruggedness with our carefully selected fleet of vehicles. When you book ZG Limo Service, you’ll get to enjoy one of our GMC Yukon XLs or Chevrolet Suburban 4x4s. Why do we choose these for our fleet? Your comfort. These vehicles can comfortable seat seven adults and their luggage without anyone feeling cramped. We’ve purchased high-end models that offer all the luxuries of a town car, too, including video and radio services to enjoy during your trip. The seats are incredibly plush so you are cradled in comfort during your ride to the mountains. Your safety. Mountain roads and weather can both be a bit unpredictable! That’s why we chose vehicles that could handle whatever comes their way. They are well made with top-of-the-line safety features and handle beautifully on wet, snowy, or icy roads. Combined with the skills of our drivers, you’ll feel completely safe inside of our vehicles. If you are coming to the Aspen area, book a ride in our of our unique fleet vehicles today. You will appreciate both their comfort and safety features along with the professionalism of our drivers. You can call us at 970-309-1680 or contact us through our website to book your vehicle.